I am tended to define the word ‘Scripture’ as Yeshua and the Apostolic Writers would have defined it : Scripture is what Tanach is. How should we regard the Apostolic Writings then (As they did not exist at the time of Yeshua): I should say they are to be considered as halacha. I think church history could confirm this position insofar we accept Hashem is a guardian to His Word. The tradition of Tanach always has been guarded very meticulously. 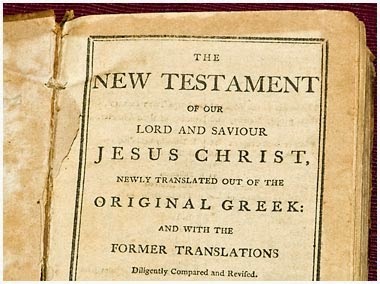 Church history shows the many difficulties in finding the oritinal writings of the ‘New Testament’ as ‘christian’ copiists were not so meticulous and even brought edited forms of original texts in order to defend their own theological views versus otherminded groups. Saying Apostolic Writings are halachic gives us a certain freedom to confront them with the Tanach as the authority of Tanach is greater, and at least submit them to Tanach in order to find a fiable meaning. This is the least we can do, I think. Meanwhile we have to remain open for scientific research and possible new discoveries in this field. It is clear that Yeshua and the Apostles used the word ‘Scripture’ to designate the Tanach. But it is also clear that the earthly life of our Lord was only the first part of his ministry and the divine revelations connected to it. After his resurrection and ascension these revelations continued through the work of the Holy Spirit of which the Apostles were the main instruments. These later revelations were not only given orally and through the practical guidance of the Spirit. They were also given scripturally, as can be seen in some parts of the Apostolic Writings. The Book of the Apocalypse, for instance, explicitly claims to be “the revelation of Yeshua the Messiah which G’d gave unto him” (Apoc. 1:1) and thus claims to be a divinely inspired text. And the Apostle Paul claimed to be backed by divine revelation in at least some of his teachings: “[…] how that by revelation he made known unto me the mystery […]” (Eph. 3:3). The Second Epistle of Peter even declares Paul’s epistles to be part of the Holy Scriptures (in II Peter 3:15-16). In my opinion it is not necessary to deny divine inspiration to the Apostolic Writings in order to give a certain primacy to the Tanach. For in the Tanach we have a hierarchical order and ranking between Scriptures which are equal in dignity qua being all inspired by G’d. The Prophets and the Writings are not less inspired than the Torah. All are part of Sacred Scripure that cannot be broken. Yet there is a hierarchical order in them because the Prophets and the Writings presuppose the Torah and have to be explained in a way that doesn’t conflict with the Torah. This hierarchical ranking also applies to the Apostolic Writings and I agree with you that we have to interpret them in a way that is in harmony with the earlier revelations in the Torah and the entire Tanach. Since the Apostolic Writings often explicitly refer to the Scriptures, or use such typical rabbinic expressions as “the Scripture says”, “that the Scripture should be fulfilled”, &c, one may be tempted to consider these as indications that their authors did not regard their own work to belong to this same category. For it seems problematic that such an expression is used in a divinely inspired work. In the Tanach such expressions are unknown. My own hypothetical take on this is that the Apostolic Writings only became necessary, as a new corpus of Scripture, after the National Kingdom Offer had failed and Israel was not prepared to accept its Messiah. This catastrophic event, that the National Kingdom Offer — which was opened by the ministry of John the Baptist — had to be closed by Paul at the end of the Acts of the Apostles because it was rejected, caused the salvation of G’d (i.e. Yeshua) to be formally sent (‘apostled’ is the term used here) to the Gentiles in Acts 28:28. The immediate effect of this ‘transfer’ of Messiah to the Gentiles was the cessation of the powerful and miraculous manifestations of the Holy Spirit leading up to the Kingdom Age. In the later Prison Epistles of Paul we no longer see these manifestations. For the long intermediate time-frame which was now opened, it became necessary to codify and canonize the teachings of and concerning Messiah. And they were codified in Greek because the mission to national Israel — not to be confused with the mission to individual Jews — had temporarily ceased. These writings were primarily addressed to the Gentiles. So if Israel had accepted Yeshua as Messiah during his earthly ministry or during the time period covered by the Acts, the Apostolic Writings would perhaps not have acquired explicit canonical status and collected in one book (the NT), because the Kingdom would have arrived within a generation and mankind would have received the necessary authoritative and infallible teachings directly from the Kingdom missionaries, as commanded in the Great Commission (Mt. 28:18-20). I’m somewhat puzzled by your classification of the Apostolic Scriptures as ‘halacha’, because these Scriptures don’t show the characteristics of the genre of halachic literature. Perhaps you mean to say that they are in the genre of authoritive commentary on the Tanach. I can agree with this up to a point, but I have to add that I view this commentary as divinely inspired and thus as being itself part of Holy Scripture.